Maintain physical and emotional wellbeing despite job pressures. The R@W Toolkit is a complementary suite of measures that recognises the inter-relatedness of employee, leader and team behavior at work. The measures can be used independently or together, dependent on the circumstances. 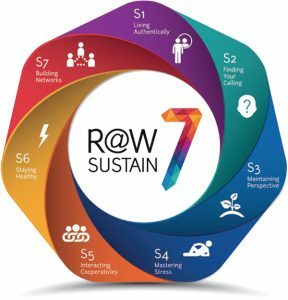 R@W Individual: A measure based on the Sustain 7 Model that assesses individual employee resilience. R@W Team: A measure that assesses the group practices that promote team resilience. This builds on the R@W Individual Scale and can be used when there is an opportunity to work with the whole team. R@W Leader: A measure that assesses the leader behaviors that support and foster resilience in employees and teams. This can be used as a stand-alone measure in coaching and leadership development or together with the other scales. Why use the R@W Toolkit? Research into employee performance and wellbeing. Is quick and easy to administer, taking only 5-10 minutes to compete on-line. The R@W Team is the aspect of the Toolkit that measures team resilience. It complements and builds on the R@W Individual by assessing the behaviours that create resilience in groups of people who work together. 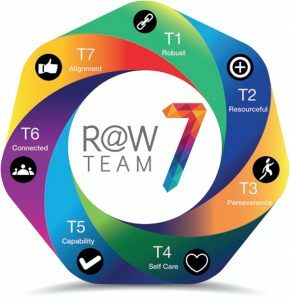 The R@W Team incorporates aspects traditionally known as essential for teamwork but also includes elements that are emerging as important team behaviours for challenging jobs. Ensure work practices are sustainable from a physical and psychological wellbeing perspective. The R@W Leader Scale assesses the extent to which managers or team leaders engage in behaviours that support resilience in the people and teams they lead. Assessments include both self-assessment (R@W Leader) and 180-degree assessments completed by the leader, and their team (R@W MyManager).